The White Train took Aberfeldie by storm in a rare break from the apocalyptic weather on Tuesday, 7th of December for a rescheduled Round 7 of Athletics Victoria’s Shield Competition. 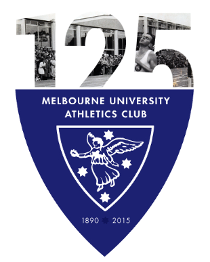 For the second round in a row MUAC claimed the victories in both the Men’s and Women’s Division 1 competitions (subject to confirmation by Athletics Victoria). The men remain dominant at the top of the ladder while the women are closing in on the top position. 11 members of the White Train claimed a tasty killer python as a reward for making their debut in Round 7. MUAC continued it’s strong team showing with 10 athletes racing the men’s 1500m, Nic Browne racking up 7 events for the evening and Kate Scarlett braving the barriers and waterjump in her steeplechase debut. The Men’s Division One team continued it’s strong participation record with 85% of all scoring positions filled. Irie Hill took out the Pole Vault with a jump of 3.40m, with Anthony Hanna completing the MUAC double with a vault of 4.20m. The women’s 4x100m relay team of Kath Clarke, Rachel Painter, Carmen Dean and Emma Doyle won in 51.37s. Lauren Boyce, in her first outing for the season, won the Triple Jump, hopping, skipping and jumping 11.07m. The White Train returned to action on Saturday at Meadowglen for Round 8 of Athletics Victoria’s Shield Competition as the team attempts to secure their positions at the Shield Final in February.